Lausanne (250,000 inh.) is the capital of the Swiss canton of Vaud on the northern shore of Lake Geneva (Lac Leman) in the French speaking part of Switzerland. The Olympic Capital spreads out over the hills along the lake, and trolleybuses (most of them with a trailer) run up and down the serpentine roads to the old city centre near Flon. 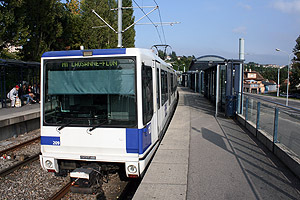 The Métro-Ouest (Metro West), now known as line m1, is a modern light rail line which connects Lausanne's city centre at Flon to Renens-Gare in the west via Chavannes and Ecublens (opened 1991). The line is mainly at grade, on a separate right-of-way with priority at road intersections. It is almost entirely single-track except at most stations where trains cross each other. The total length is 7.8 km with 15 stations (3 underground, average station distance is 557 m), a ride takes 19 minutes. 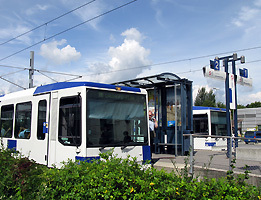 The line is especially busy with students travelling to the EPFL and UNIL University campuses. 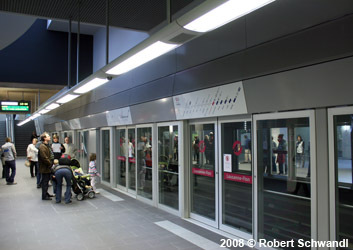 Taking advantage of the former Métro-Ouchy right-of-way, a fully automated metro line (URBALIS system from Alstom), the m2, started revenue service on 27 Oct 2008, after an official opening celebrated on 18 Sept 2008. After a referendum held in Nov. 2002, construction began in late 2003. 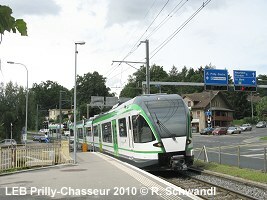 On the old section, the former Montriond station was renamed Grancy, and moved towards Gare CFF. A new station was added between Grancy and Jordils, named Délices. The m2 connects Ouchy and the central railway station to Croisettes in the north-east, with most of its alignment being underground, after most of the sections of the old line have been covered and a park created on the surface. 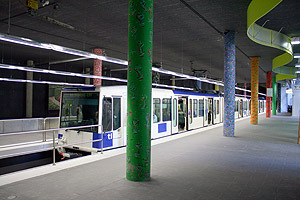 At Flon transfer is provided to line m1 (Métro-Ouest) and the LEB Railway. 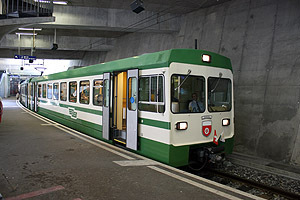 The entire rubber-tyred line is double-track except for a short single-track section, where trains pass under the Federal Railway tracks in the old tunnel used by the rack railway. Along the approx. 6 km route there is a change in altitude of 338 m, with a maximum gradient of 12%, and an average gradient of 6%. Lausanne-Gare CFF station has platforms with an 11.5% slope! At 25 m below the surface, Fourmi station is the deepest. 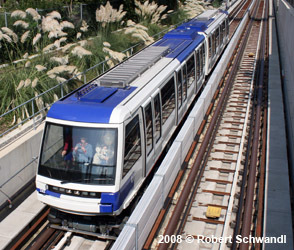 The automatic metro line is 5.9 km long with 14 stations. 15 2-car trains, similar to Paris's MP89 vehicles (line 14) but only 30 m long, were delivered by Alstom. The depot is linked to the Vennes station. 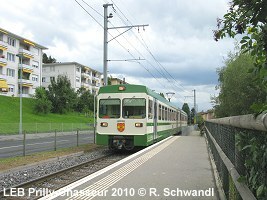 The LEB is a suburban railway serving the north-western parts of Lausanne and its surrounding towns. It runs underground from its Flon terminus, which opened on 28 May 2000, to a point halfway between Chauderon and Montétan, then on-street up to Montétan before finally reaching its own mostly single-track right-of-way. The entire line is 24 km with 23 stops.